Binti is the first of the Tor.com novellas that has turned out to be slightly disappointing to me, but I think that’s because my expectations were so very high after reading Nnedi Okorafor’s previous work over the last few years. It was always going to be hard for this story to live up to the power and beauty of Lagoon or Who Fears Death or The Book of Phoenix. This isn’t to say that I didn’t like Binti. Indeed, there’s a lot to love about this little book, although probably my first complaint about it would be that it is so very little. 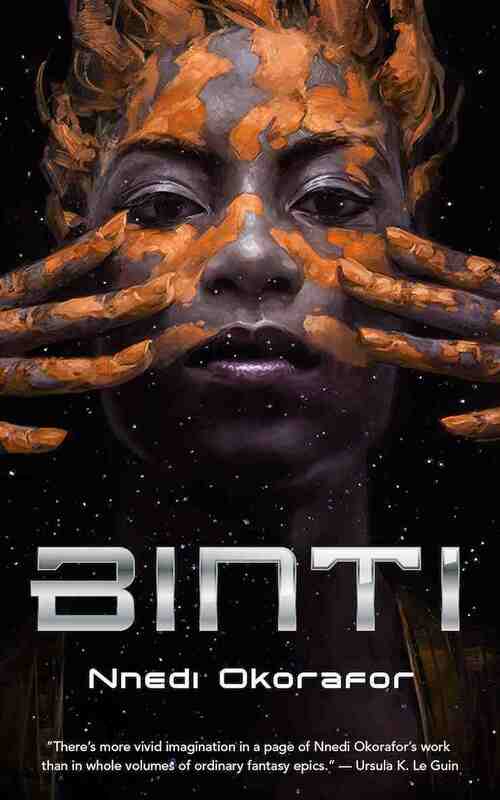 Of the Tor.com novellas I’ve read so far, Binti has by far the lowest page count, which is a shame if for no other reason than I never want any book by Nnedi Okorafor to end. My second complaint, and a more substantive one, is that Binti relies a little too much on magic in order to move the story along. Okorafor has always created worlds with a synthesis of magic and science, but here the magic becomes too much of a deus ex machina. Considering the book’s hefty messages about colonization, racism, and the nature of humanity, this excessive mysticism may be intentional, but I found it a bit much at times. Binti‘s greatest strengths, on the other hand, lie in Okorafor’s gift for crafting characters and cultures. Binti herself is a wonderful heroine, if perhaps a little unrealistic in her lack of any real flaws, and her Meduse counterpart Okwu is excellently conceived and nicely-written. The Meduse people in general are fascinating, although their grievance was resolved a little too neatly in the end. The very best part of the book, though, is the way Okorafor weaves in Binti’s personal history and shows the complicated feelings Binti has about her people, her culture, and her sense of self. There’s something rather melancholy about the ways in which Binti’s journey changes her, but I quite like the idea that every journey–no matter how much we start on our own terms–is a journey into an unknown and uncontrollable future. What I like even more, however, is the idea that we can always save something and take it with us. I love the idea of something as culturally and regionally specific as the Himba people’s otjize lasting long enough in time and space for someone to wear it to college on another planet, and in Binti otjize becomes a perfect symbol of resistance, endurance, and connection to the past. I just wish there was a little more plot happening. There’s just not much going on, and the novella ends up feeling both uneventful and overstuffed with meaning. Without a strong story to support all of the big ideas Okorafor is weaving together, Binti starts collapse under its own weight. It’s a shame, because Binti herself is a great character that I’d love to see more of.